Second Lieutenant Todd J. Bryant, 23, of Riverside, California, was killed on October 31, 2003, in Al Fallujah, Iraq. Bryant was on patrol when an improvised explosive device exploded. Bryant died of his injuries. Bryant was assigned to 1st Battalion, 34th Armor Regiment, 1st Infantry Division, Fort Riley, Kansas. On the day Todd Bryant died. His fight made the world a better place. His love of country gives courage a face. "For mission and men, whatever the place." Til the day Todd Bryant died. I noted that you recently updated Todd's page with an article about the conference room at West Point. One of the plaques in the conference room is a copy of a poignant eulogy from his sister which says in essence that the best way to honor Todd is to not forget him. Your keeping the site current is one part of that, and as his father, I thank you. from California to North Carolina via Washington state, and on the right of his stone, you will see a miniature replica of his beloved In-n-Out Double Double. Thank you for your hard work and dedication to reminding us of the cost of the freedoms we cherish and too often take for granted. On October 31, 2003, somewhere in the Iraqi desert between Fallujah and Baghdad, First Lieutenant Todd Jason Bryant was killed when his Humvee was struck head-on by a rocket-propelled grenade. His life would be taken instantly at age 23. On August 30, 2003, he had married Jenifer Reardon; they would have just nine days together before his deployment to Iraq. But the memory of this jovial, fun-loving man would live on forever through his family and friends. "There was a lot more to him than just a soldier," Jenifer Bryant said. "He was my best friend. His goal in life was to make people think that he was the most hilarious man alive." Not a single person in attendance at Riverside National Cemetery for Todd Bryant's memorial service would disagree. Everyone who spoke of or remembered him wore a smile when retelling one of his pranks. Smiles came along with tears at the Veteran's Amphitheater Saturday afternoon under the gloomy sky. Linda and Larry Bryant, Todd's parents, projected a strong exterior while consoling those in attendance. More than 100 friends, family, service members and dignitaries spoke of the void that he left behind. "One day he thought about running for Congress," said Rebecca Hartmann, representative for Congressman Ken Calvert, R-Riverside. "I was very attached to him. He would call, come visit when he was on leave. We were all very fond of him." Todd Bryant's parents worked for Jet Propulsion Laboratory in Pasadena while he attended La Canada High School. At age 17, he joined the Army Reserves and completed boot camp. He returned to Riverside and applied to Calvert's office for a nomination to West Point Academy in New York. He received the nomination, and graduated from West Point in 2003. While in Iraq, he told his family that what he missed most about the United States was In-N-Out Burger. That was his favorite, said Jenifer Bryant, remembering the lighter side of her husband. Before the couple married, they wrote descriptions of one another. Todd Bryant said his future wife's "heart is so full of love that there are no words to describe how lucky I am to be the guy she wants to share the rest of her life with." Jenifer Bryant said her husband was her soul mate and the nine days they spent together before his deployment were her greatest gift. She wears the Irish wedding band he gave her and holds it when she speaks of him. His dream, she said, was to one day become a high school football coach. Brigadier General Charles Lamb recounted Todd Bryant's dedication to his country. "The opportunity for service is one of my most cherished goals," Lamb quoted from an essay Todd Bryant wrote during his senior year of high school for admission to West Point. "And if be I'll fight and die for my country in defense of our freedom." He is survived by his parents, his brother Major Tim Bryant, and his sister Capt. Tiffany Bryant, who nicknamed her brother "Poco" for his love of life as a child. 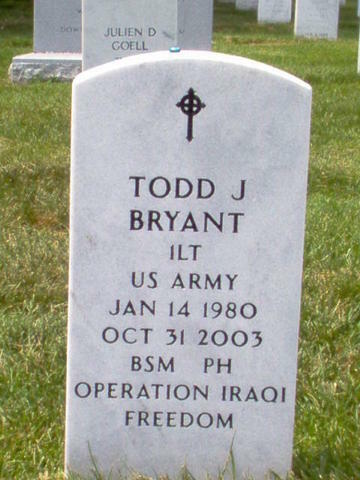 Todd Bryant was laid to rest at Arlington National Cemetery in Washington, D.C., on November 18, 2003. He was posthumously awarded the Bronze Star, the Purple Heart and the National Defense Service Ribbon. Second Lieutenant Todd Bryant, a native of Riverside, California, and a 2002 U.S. Military Academy graduate, died October 31, 2003, in Iraq when his Humvee encountered an explosive device on the road between Fallujah and Baghdad. Bryant was 23. West Point Superintendent, Lieutenant General William J. Lennox Jr., said the loss of this fine, young soldier is devastating. "Todd Bryant demonstrated his leadership abilities and professional spirit during his entire time at the academy," Lennox said. "He was a tremendous individual and a remarkable officer who will be sorely missed by everyone who had the privilege to know him. "Our thoughts and prayers go out to his family," Lennox added. The youngest child of Larry and Linda Bryant , Bryant was stationed at Fort Riley, Kan. His parents spoke with local reporters Monday about their reaction on finding out that the Army was sending Todd to the "Sunni Triangle" in Iraq. "We knew it was not going to be a good situation," Linda Bryant said in a telephone interview with Press Enterprise reporter Sandra Stokely. The Bryants’ said their worst fears were confirmed when they learned from daughter Tiffany, a West Point Class of 2000 graduate, that Todd had been killed. The family held a memorial service for Bryant Wednesday at Fort Riley. Bryant’s two siblings Marine Major Timothy R. Bryant and Captain Tiffany Bryant attended. Larry Bryant said the Army has not yet told him when his son’s body will be sent back to the United States. "He will be buried in Arlington National Cemetery," the grieving father said. California representative Ken Calvert, who appointed Todd and Tiffany Bryant to West Point, told reporters Bryant was "the best the country has to offer." "It’s a real tragedy," Calvert said. "He was a wonderful soldier doing his responsibility." The La Canada Flintridge community is reeling from the news that one of its native sons has died while serving with U.S. Army forces in Iraq. Second Lieutenant Todd Bryant, a 1998 graduate of La Canada High, was killed last Friday by an explosion on the road between Fallujah and Baghdad in western Iraq. According to military reports, the 23-year-old officer was riding in a Humvee October 31, 2003 when a roadside bomb went off at 8:30 a.m. local time. The other four soldiers traveling with him were wounded. "Todd Bryant had already accomplished so much in his young life, and had both the potential and desire to do so much more. All of us, as well as our country, have suffered a great loss. Todd was well aware of the dangers facing him, but was trained to do what was needed to be done. He was an outstanding soldier above all else," said LCF resident Anita Brenner-Torres, a longtime friend of the Bryant family. Bryant, a 2002 graduate of West Point, arrived in Iraq on September 2, 2003, as a member of the 82nd Airborne Division. The young soldier's death came just two days before 16 of his countrymen were killed when a Chinook helicopter ferrying U.S. service personnel to Baghdad's international airport was shot down by a shoulder-fired missile. Since the war in Iraq began on March 19, more than 350 American troops have lost their lives in combat or in other incidents. 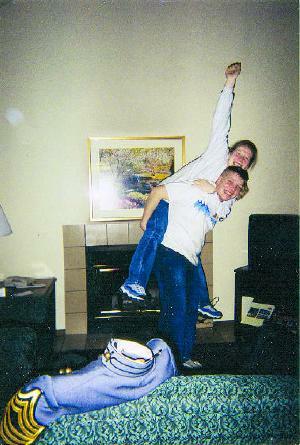 On August 30, 2003, just a few days before Bryant shipped out for the Middle East, he married Jen Reardon. The couple had planned the wedding for more than a year; just a few days before the event, he received his orders to report for duty. A memorial service was held for Bryant yesterday morning (Wednesday) at the Morris Hill Chapel at Fort Riley, Kansas. Burial will follow at Arlington National Cemetery in Virginia next week. A local memorial service for Bryant will be held sometime in the next few weeks. The city's parks and recreation department has also received a request to add a new plaque at Memorial Park. A scholarship will be established at the high school in Bryant's memory and service to his country. Besides his wife, Bryant, most recently a resident of Riverside, is survived by his parents, Larry and Linda Bryant, an older brother Tim, and a sister, Tiffany. His father works at the Jet Propulsion Laboratory while his mother retired from there. Bryant came from a military family, as both his parents are former military officers. Brother Tim is currently a Major in the U.S. Marine Corps, while sister Tiffany, also a graduate of West Point, is a Captain in the Army. Both of his siblings had served in the war region before Todd was assigned there. Brenner-Torres, after receiving a phone call from Bryant's mother, who now lives in Orange County, placed a candle in his honor and memory under the American flag in Memorial Park on Saturday. As others heard about his death, they have come forward to honor him by leaving flags and flowers. Bryant's former Palm Crest Elementary School principal, Don Hingst, recalls the young man as being full of life and one of the students who had a natural curiosity about everything. When he heard the news, Hingst e-mailed Bryant's elementary school teachers and they all wrote back saying, "He was my favorite student." One teacher in particular, Hingst said, remembered the young man fondly. "Kathy Blackstock, a teacher now in Nashville, Tennessee, remarked how Bryant is with her in her classroom every day, as he quoted something that was so profound, she wrote it down and put it up in her classroom, where it remained," he said. Mike Leininger, La Canada High principal, said of Bryant, "He was a great kid, very well rounded. It is a tragic shame. Things like this are not supposed to happen this way." The Petersen family of La Canada also remembered Todd from elementary school through high school. Martha Petersen recalls how polite and respectful Bryant always was, even as a youngster. "He was always smiling and you could never forget his dimples. The news left us devastated," she said. Her daughter, Erika Petersen, remembered Bryant as well. "Todd had the most beautiful smile," she said. Her brother, Chris Petersen, was a close school friend of Bryant's who played on the Spartan football team with him and was in the school band with him. Petersen, now a Corporal in the Marines who served in Iraq this year from February through September, recalled how Todd loved Notre Dame. "I remember the last game of the season in high school and he got the ball. He was truly 'Rudy'," Petersen said. 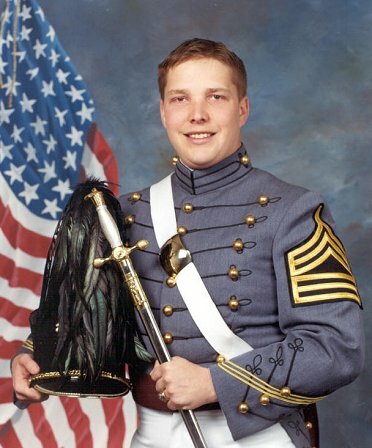 A page has been dedicated to Bryant on the West Point Web site, www.west-point.org/users/usma2002/x23630/. Watch this paper for details of a memorial service to be held in La Canada Flintridge within coming weeks, organized by Brenner-Torres and former LCF Mayor Barbara Pieper. In lieu of flowers or other memorial items, the family of Todd Bryant, the young solider killed in an explosion in Iraq on Friday, has asked that any donations be made to a special fund that is being set up in his honor. The donations should be made to the Second Lieutenant Todd Bryant Memorial Scholarship, which will be awarded to a deserving La Canada High senior. Todd graduated from LCHS in 1998. Checks should be made out to: Community Scholarship Foundation of La Canada, Inc., P.O. Box 111, La Canada Flintridge, CA 91012. Those sending donations should identify the "2nd Lt. Todd Bryant Memorial Scholarship" in the memo portion of the check. TIKRIT, IRAQ - Iraq An Army Black Hawk helicopter crashed Friday apparently shot down by insurgents killing all six U.S. soldiers aboard and capping the bloodiest seven days in Iraq for Americans since the fall of Baghdad. In retaliation, American troops backed by Bradley fighting vehicles swept through Iraqi neighborhoods before dawn Saturday, blasting houses suspected of being insurgent hideouts with machine guns and heavy weapons fire. "This is to remind the town that we have teeth and claws and we will use them,' said Lieutenant Colonel Steven Russell, commander of the 1st Battalion, 22nd Infantry Regiment. Russell also said the 11 p.m. to 4 a.m. curfew, which had been lifted at the October 27, 2003, start in Iraq of the Islamic holy month of Ramadan, was reinstated Friday night. The U.S. death toll for the week climbed to 32, including those aboard the Black Hawk. Two other soldiers were killed near Mosul, raising concerns that the insurgency was spreading north. A 23-year-old Inland Empire soldier was killed October 31, 2003, in Al Fallujah, Iraq. Second Lieutenant Todd J. Bryant, son of Larry and Linda Bryant of Jurupa, was on patrol when an improvised bomb exploded on the road between Fallujah and Baghdad, an area active in anti-U.S. occupation, said officials at Fort Riley, Kansas. Bryant, a 2002 graduate of the U.S. Military Academy at West Point, was stationed with Company C, 1st Battalion, 34th Armor Regiment of the 1st Infantry Division. He was a tank platoon commander and was sent to Iraq in September, Army sources said. Bryant married Aug. 30. He was the youngest of three siblings in the Army, including a sister, Tiffany, who served in Afghanistan, and a brother, Tim. The family attended a memorial service at Fort Riley on Wednesday. Bryant is expected to be buried at Arlington National Cemetery. U.S. policy, meanwhile, suffered another setback as Turkey decided not to send troops to Iraq because of strong opposition from Iraqi officials. The Black Hawk crashed on an island in the Tigris River and burst into flames the third crash caused by hostile fire in two weeks and the second causing fatalities. Maj. Josslyn Aberle said the cause of the crash had not been determined, but several other officers believed it was shot down. After the raids before dawn Saturday, intermittent explosions and the crackle of random gunfire could be heard across Tikrit. The helicopter, assigned to the 101st Airborne Division, went down about 9:40 a.m. about a half-mile from the U.S. base in Saddam Hussein's former palace, which serves as headquarters for the 4th Infantry Division. Afterward, attack helicopters cruised throughout the day over Saddam's hometown, swooping low over villages and farms as rescuers picked through the charred wreckage of the aircraft. Late Friday, U.S. troops fired mortars and a U.S. jets dropped at least three 500-pound bombs around the crash site, rattling windows over a wide area in an apparent show of force. Other U.S. jets streaked over Tikrit after sundown. At least three mortars were fired onto the U.S. compound, but caused no damage. The dead included the Black Hawk's four-member crew and two soldiers from Department of the Army headquarters, according to a Pentagon spokesman, Maj. Steve Stover. In Mosul, 250 miles north of Baghdad, guerrillas attacked a convoy with rocket-propelled grenades and small-arms fire Friday. The military said one U.S. soldier died and six others were wounded in the clash. Another soldier died in Mosul the night before when a homemade bomb exploded, the military said Friday. Both of those soldiers, as well as the Black Hawk's four-man crew, were from the 101st Airborne Division, based at Fort Campbell, Kentucky. Three others were injured later Friday when a roadside bomb exploded near the Mosul Hotel, which is now used as a military barracks, the military said. Mosul, Iraq's third largest city, had been considered relatively safe for American soldiers until an escalation of attacks there over the past three weeks. U.S. officers have long been concerned about the safety of aviation because of the hundreds, perhaps thousands, of shoulder-fired missiles still missing in Iraq after the collapse of Saddam's regime in April. On October 25, 2003, insurgents shot down a Black Hawk over Tikrit, injuring one crewman. On Sunday, insurgent gunners brought down a Chinook transport helicopter west of Baghdad, killing 16 Americans in the bloodiest single strike against U.S. forces since the war began March 20, 2003. An Apache attack helicopter was shot down in June in the western desert but the two crew members escaped injury. The latest fatalities brought to 32 the number of American soldiers who have died in Iraq in the first week of November. That includes one 1st Armored Division soldier who died in a non-hostile shooting incident. In addition, two American civilian contractors working for the U.S. Army Corps of Engineers and a Polish officer also died in attacks in the past seven days. The death toll of 32 was by far the largest for any seven-day period since President Bush declared an end to hostilities on May 1 mainly because of the Chinook crash Sunday that killed 16. In all of October, for instance, there were 42 deaths; in all of September, 31. The U.S. military said the number of daily attacks on coalition forces dropped to 29 last week from a spike of 37 the week before but cautioned against drawing conclusions from the decrease. U.S. officials had hoped to encourage more countries to send troops to Iraq to relieve the burden on American forces. Turkey's parliament agreed last month to allow the government to send Turkish troops, a move which drew sharp opposition from Iraqi politicians. But Secretary of State Colin Powell and Turkey's foreign minister have agreed that Turkey will not send peacekeeping troops to Iraq, officials said Friday, after plans for a deployment raised sharp opposition from Iraqis. The decision reverses what had been a significant victory for Washington, which has pressed hard for Turkey to join peacekeeping efforts in its neighbor to the southeast to help U.S. troops there. Turkey is the only majority Muslim nation in NATO. Powell and Foreign Minister Abdullah Gul spoke Thursday night by telephone and agreed that the offer of Turkish troops would be withdrawn, State Department spokesman Richard Boucher said. Marchers stopped at the heavily fortified compound and sent a three-member delegation inside to present their demand. After a 45-minute meeting, the three delegates returned, saying they had been promised "that something good would happen,' according to one of them, Sheik Awad al-Haradan. Another delegate said the Americans asked them to work on stopping anti-coalition attacks in Iraq. "They wanted us to give them guarantees that what they call violence ends. We told them that this will only end when the last American soldier leaves the country,' said Sheik Abdel-Sattar al-Janabi. Of Fort Riley, Kansas, died while on active duty with the U.S. Army in Iraq on October 31, 2003. He was born on January 14, 1980 in Long Beach, California. Todd was 1998 graduate of La Canada High School and a 2002 graduate of the United States Academy at West Point. Todd was the beloved husband since August 30, 2003 to Jenifer A. Bryant; loving son of Larry W. and Linda Lee Bryant of Riverside, California; brother of Tim Bryant of Centreville, Virginia and Tiffany Bryant of Fayetteville, North Carolina; grandson of Betty McAllister of Cincinnatti, Ohio. The family will receive friends on Monday, November 17, from 6 to 8 p.m. at THE ADAMS-GREEN FUNERAL HOME, 721 Elden St., Herndon, Virginia. Funeral services will be held on Tuesday, November 18, at 1 p.m. at First Presbyterian Church, 601 North Vermont Streeet, Arlington, Virginia. Graveside services with Military Honors will be held at 3 p.m. at Arlington National Cemetery. The family suggest that memorial contributions may be made to Community Scholarship Foundation of La Canada Inc., c/o The Todd Bryant Scholarship, P.O. Box 111, La Canada-Flintridge, California 91012. WEST POINT, N.Y. -- For most Americans, Iraq is very far away. But for the cadets at the U.S. Military Academy, particularly the seniors who will soon be officers over there, the war intrudes daily. West Point has added classes on how to avoid ambushes, proper convoying techniques, the correct procedure for emptying a room when fighting door to door. "I'm 22 years old," said Cadet Ramon Ramos, "and sometimes I'll think, 'Wait a minute, did I really just have a class on how not to get blown up by an insurgent?' "
E-mail brings the war to the dorms. The night before the battle for Fallujah began, senior Mark Erwin got a message from his brother, Lt. Mike Erwin, West Point '02: "Markie -- I will be carrying your cadet picture in my right breast pocket with my prayer to St. Michael, dog tags and St. Michael's medal," the big brother wrote. "If by some chance something happens to me, you're the voice to the family." Cadet Erwin never deletes an e-mail message from his brother. "You worry there might not be another," he said. Lunch can be the worst. "If they say the words, 'Please give your attention to the first captain,' you know it's coming," said Cadet Michael Linnington. Another senior, Cadet Megan Williams, said: "Everyone shuts up. You're so afraid of it." Linnington explained: "There was one the other day. The first captain gives a 30-second spiel -- what year they graduated, how they died, if they were married." 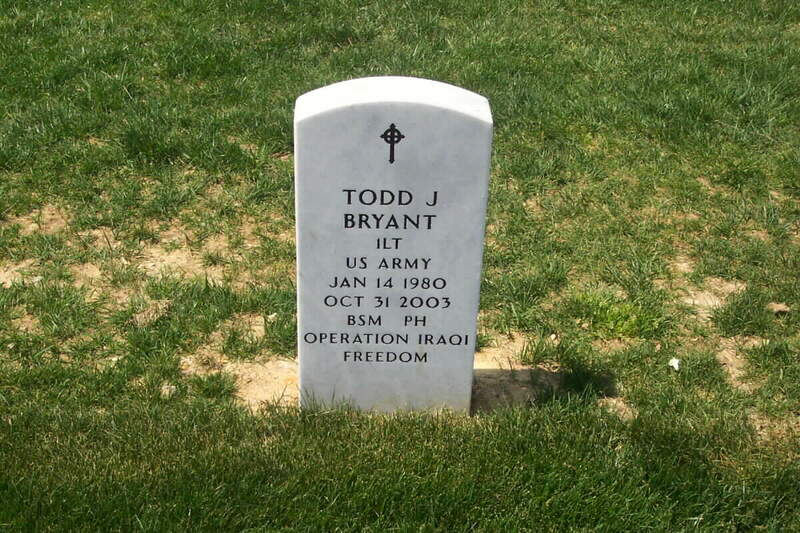 The death of Todd Bryant ('02) in Fallujah touched many seniors. When Ramos was an 18-year-old plebe, Todd Bryant was his intramural football coach. "I sat at his table," Ramos said. "Some upper class give plebes a hard time. Not Todd. He was just a nice guy." Company D named a meeting room for Todd Bryant last month. "His family and wife came from California," Linnington said. "They had a slide show about his cadet life, and you watch it -- it's your life. What we're doing now, it's what he did. It puts it into reality." The cadets feel strange being so preoccupied, when their friends outside the military seem barely aware. Williams has a younger sister going to college at home in Texas. "You try not to judge," Williams said, "but they're very oblivious." Cadets go to more funerals than most 20-year-olds. Williams attended a service for David Bernstein ('01), killed in an ambush in Taza. "I didn't know him," she said. "But I'm Jewish, and he was, and that touched me." When Cadet Brandon Bodor was in Washington for the inauguration, he stopped at Arlington National Cemetery, at the grave of Leonard Cowherd ('03), who was killed in Karbala. "Lenny was a good guy," Bodor said. Cadets don't have to study the opinion polls to know they're heading off to an unpopular war. Applications to the military academies are down substantially. At West Point, applications hit a post-9/11 high of 12,383 for the school year that began 2003. The 10,412 applications for the coming school year represent a 16 percent drop in two years. The Naval Academy is down 2,852 applicants, a 20 percent drop in just a year, and the Air Force Academy is down 3,054 applicants from 2004, a 24 percent drop. After two years at West Point, a cadet is given a last chance to leave without having to serve in the military. Last summer, 52 members of the sophomore class of 963 left, compared with 32 the year before and 18 the year before that. West Point officials were relieved it wasn't more. "We were hearing rumors of mass resignations," said the admissions director, Col. Mike Jones. "But it was just rumors. Our numbers are down, but still very strong," he said, citing 10 applicants for every slot. Bodor said it's no mystery why the numbers are down. "Iraq," he said. "Same as Vietnam. When you're in an unpopular war, people question, 'Is this what I want to be doing?' "
These cadets, who get a free education in return for five years of military service, are likely to face two Iraq tours if current projections hold. Their own feelings about the war seem surprisingly mixed. While Erwin and Williams expressed confidence in the effort to establish a democratic society in Iraq, Linnington, Ramos and Jarick Evans sounded less hopeful. "There are cadets who might not want to go, they might not believe we should be over there the same way the American public feels," Linnington said. "But as military people we have a duty." Ramos sees the division of opinion in classroom discussions. "At this point, to me, it's too late to debate," he said. "We may not like it, but we have to make the best of it. We're there." He is grateful, he said, "that the American public knows it's not the soldiers' fault if they disagree with the war." In April 2001, Cadet Todd Jason Bryant took visiting La Cañada Flintridge residents on a tour of his beloved West Point Military Academy. He walked with them along the bluffs overlooking the Hudson River, by the Visitor Center, past stately buildings, chapels and classrooms etched with the history of time, going back to its founding by George Washington and his Revolutionary Army two centuries ago. During this tour, he spoke reverently of those who had lost their lives serving their country, and proudly of famous West Point graduates and their accomplishments. In a perfect world, the 2002 West Point graduate could have fulfilled his dreams of serving his country through his military service, and then continue on to serve, perhaps later as an elected official. He often told former classmates at La Cañada High, half joking, half serious, that he wanted to one day become governor of California. And, perhaps one day he could have been, though we will now never know. Three years ago, on October 31, 2003, Second Lieutenant Bryant was killed in Iraq by an improvised explosive device, or IED, as he traveled in a Humvee on the road between Fallujah and Baghdad. 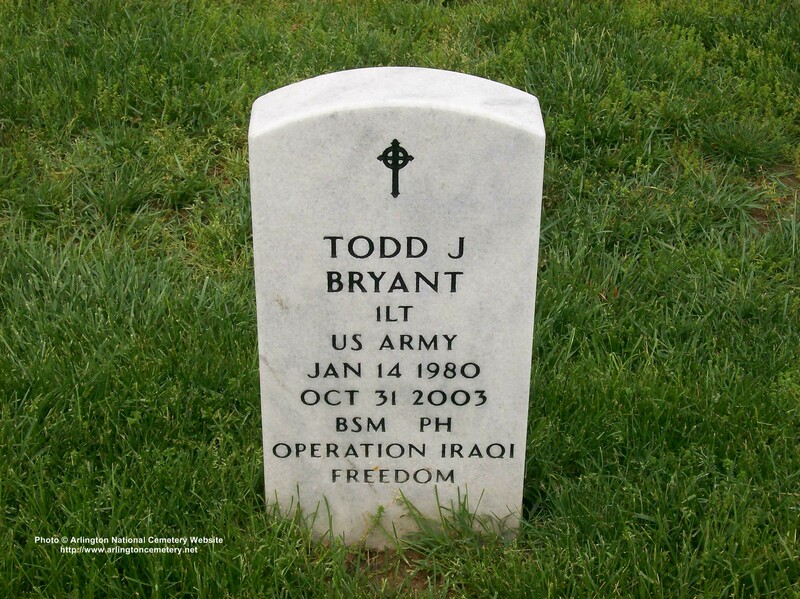 Bryant was a member of Company C, 1st Battalion and 34th Armor Regiment of the 1st Infantry Division at Fort Riley, Kan. He deployed with his unit in support of Operation Iraqi Freedom in September 2003. His task force was assigned to an area of operation covering Ar Ramadi and Al Fallujah, Iraq. He was posthumously awarded the Bronze Star and Purple Heart, and promoted to First Lieutenant. 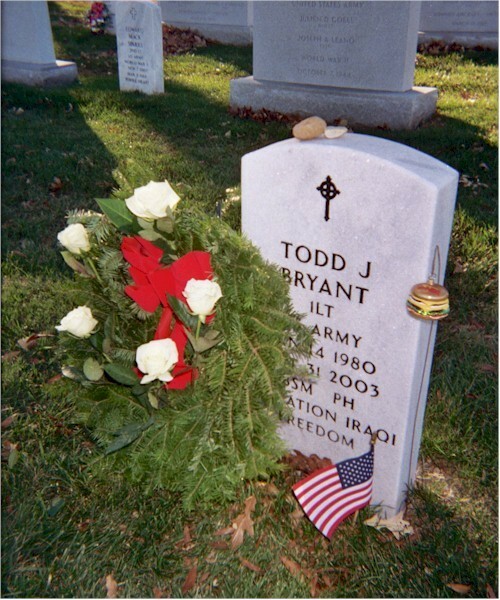 Bryant was buried at Arlington National Cemetery on November 18, 2003. A moving memorial ceremony, complete with white doves being released toward the heavens, was also held in La Cañada's Memorial Park. Even more than that essence of life he left behind, as all cadets do during the years they spend there studying and training in service of their country, Lieutenant Bryant has now himself become part and soul, and even a spiritual force, of the West Point he loved. On a cold and snowy January 8, 2005, USCC Company D, First Regiment dedicated a regimental conference room in Sherman Barracks in honor of Bryant. "We chose one of the larger study rooms in Sherman Barracks for the dedication," said Captain Darin Thomson, a D1 tactical officer. Attending that ceremony were Bryant's parents, Linda and Larry Bryant, his brother, Major Timothy Bryant, USMC, and Bryant's widow Jenifer, whom he married 11 days before his deployment. Bryant's sister, Tiffany, who graduated from West Point in 2000 was not in attendance. This past week, on the third anniversary of his death, a cabinet made of cherry wood was placed in the conference room. Inside this cabinet, and now resting in dignified repose in tribute to Bryant, are personal items such as copies of certificates for his honors — Bronze Star with a Combat "V," a Purple Heart, the Iraqi Freedom Medal and Meritorious Service Medal, as well as photographs, a flag flown over the US Capitol on the first anniversary of Bryant's death, arranged by Congressman Ken Calvert, and Bryant's West Point ceremonial sword. Capt. Thomson photographed the cabinet for the Bryant family. In a message to the Bryant's, Thompson said, "We are very proud of our conference room and the upgrades we've been able to make. We are especially proud to be able to continue to honor Todd. I know you feel his loss every day and that it is especially hard around this time, but I hope you know that the memory of him serves as an inspiration to all of us every day as we see his picture, see his name and know of his sacrifice. " 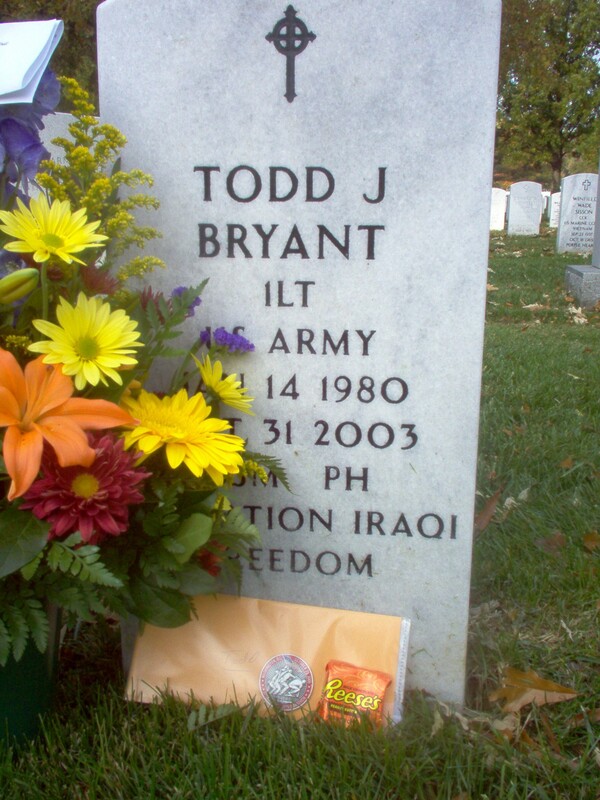 Now, as current and future West Point cadets take family members and friends on their personal tours, they too will speak in hushed and respectful voices of the sacrifice Lieuenant Todd Jason Bryant made for his country. The news report was brief. Datelined October 31, 2003, it said Army Second Lieutenant Todd J. Bryant died when an explosive device struck his Humvee as it traveled between Fallujah and Baghdad in Iraq. Bryant, a California native, was 23. What the report didn’t say was that Bryant loved In-N-Out burgers and playing pranks, that he had a wildly romantic streak and had solemnly pledged lifelong love to biology teacher Jenifer Reardon during a rose-covered ceremony at St. John the Evangelist Church in Pittston. “We didn’t say ‘Till death do us part’ because even if one of us was gone our love would continue,” says Reardon, a Pittston native now living in Virginia to be closer to her husband’s grave at Arlington National Cemetery. Bryant was killed barely two months after their wedding – or, as Jen puts it, 55 letters later. Excerpts from those letters appear in “In a Time of War” by Bill Murphy Jr., whose new book chronicles the West Point Class of 2002 along their journey from cadet at home to soldier at war. The book revolves around three soldiers, but as the first in his class to die, Bryant’s story dominates. The first chapter belongs to the baby-faced soldier, with vivid descriptions of his love of country, sense of duty and whirlwind romance with Jenifer. Describing Todd, Jen alternates between laughter and tears. “You have to make peace with it,” she says. While baring painful details was difficult, she’s proud of the “outstanding” portrait the book paints of Bryant and his fellow soldiers. Bryant is one of 4,789 men and women from the U.S. – including 215 from Pennsylvania – to have died to date in Iraq, Afghanistan and other regions since war began, according to the Department of Defense. Another 33,216 have been wounded, as of October 9, 2008. Todd Bryant’s first real encounter with Pittston took place at a perfect time of year. The Pittston Tomato Festival. In many ways, the two were opposites. Jen, a 1999 Pittston Area High School graduate, grew up near “The Junction,” the daughter of Patricia Reardon, a former nurse, and Donald Reardon, a former supervisor at St. Michael’s in Tunkhannock, and older sis to Amanda, Erin and Molly. Bryant was a sometime child actor raised in Southern California, the son of Larry and Linda Bryant, an engineer and attorney who retired from the U.S. Air Force and worked at the Jet Propulsion Laboratory. Todd’s older brother Tim is a lieutenant colonel in the Marine Corps, and his older sister Tiffany graduated West Point in 2000. While Bryant long dreamed of attending Notre Dame, the family tradition of service proved too hard to ignore. Still, says Jen, he longed for life after the Army, when he’d enter politics, run for California governor and then teach high school history and coach his beloved football. Differences aside, Todd and Jen shared a sense of duty. “I had a lot of great teachers in high school and got to college on scholarship so I wanted to give something back,” she says of teaching after Boston College. They met through a fluke, introduced by a fellow BC student Bryant had grown up with, and enjoyed a 21st century courtship via hours of nightly instant messages. Months passed before Bryant got a pass from West Point for a face-to-face in Boston. They squeezed in two visits before Bryant left for a summer in Korea and Jen returned to Pittston. Hours of phone calls and dozens of letters written on the back of Far Side cartoon calendars followed. Finally reunited, Bryant whisked Jen away over Labor Day weekend 2001 for an early 21st birthday present at a Massachusetts bed and breakfast. 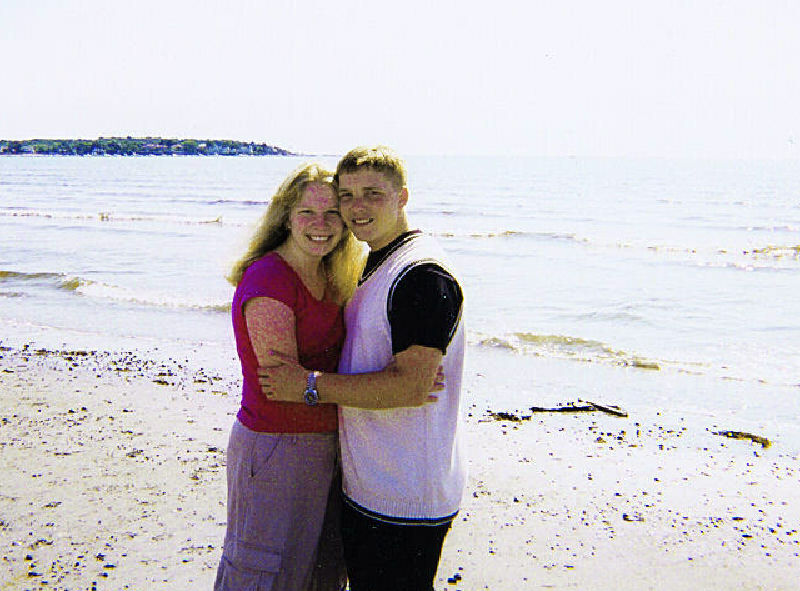 On Labor Day weekend, 2001, Todd Bryant and Jenifer Reardon were able to spend time together in Massachusetts. Less than two weeks later, the planes hit. That Christmas, Jen flew to California to meet the Bryant family. As a gift to reflect their shared heritage, Jen gave Todd an Irish Claddagh ring. Walking back to the car after a movie, Todd suddenly pulled out a ring box. Shocked, Jen said, “You can’t propose in a parking lot!” It wasn’t a diamond – it was another Claddagh ring, with two hands clasping a heart surmounted by a crown to symbolize love, friendship and loyalty. On March 2, 2002, Bryant made it official after “100th Night” weekend at West Point, when “the long gray line” celebrates the final slide toward graduation. He booked a room at Manhattan’s luxurious Waldorf Astoria. The next morning, the couple dined on Dunkin Donuts bagels and coffee in Bryant Park. In exchange for his West Point education, Bryant had committed to five years service, a promise made in peacetime. Even as everyone held their breath, the couple excitedly made plans. After the Army, they planned to live in Boston before moving to California. They’d have three kids. Jen was in the audience June 1, 2002 when President George W. Bush told Bryant’s West Point graduating class that history had issued its call to their generation. The commencement speech outlined what came to be known as the “Bush Doctrine” of anticipatory self-defense. Reading the speech later gave Murphy the idea for the book about the class. To read and download for free the first chapter of “In a Time of War: The Proud and Perilous Journey of West Point’s Class of 2002” by Bill Murphy Jr. go to www.inatimeofwar.com. The book is also on all major bookseller websites, with links available via the book’s web site.